Our Oval Retro Dinette Table 36×60 with Retro Chrome Legs is shown in premium red cracked ice laminate with 3″ real metal banding, and classic chrome legs. This 36″ x 60″ table is available in your choice of standard or premium laminates, 2.25″ or 3″ metal banding sizes, and classic or single pole legs. Other sizes available. 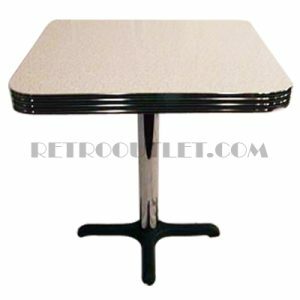 Please allow 4-5 weeks for production of our retro dinette tables.